Lately, for many agencies and companies, the usual medical certificate from the doctor isn't enough to grant official sick leave to an employee. They cut the days' pay if the employee doesn't secure a Ministry of Health attested sick leave certificate. Even a day's leave requires an MOH sick leave note. In some clinics and medical centres in Dubai, online attestation is available at an additional cost of AED75, with or without insurance. I asked why the doctor's medical note isn't recognized anymore. 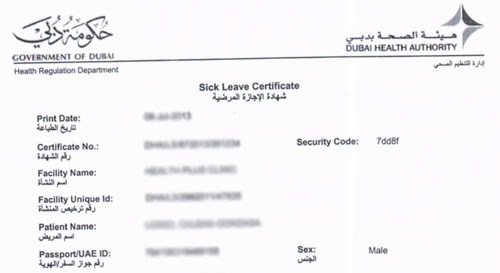 Apparently there are some people who would connive with doctors for a (fake) sick leave certificate. So you know, they could skip the day's work and still get paid. So we pay AED75 to not lose the day's salary, actually. Meh.